Excerpts from this story were taken from the Preventing RHD through community-driven activities article available on the Telethon Kids Institute website. 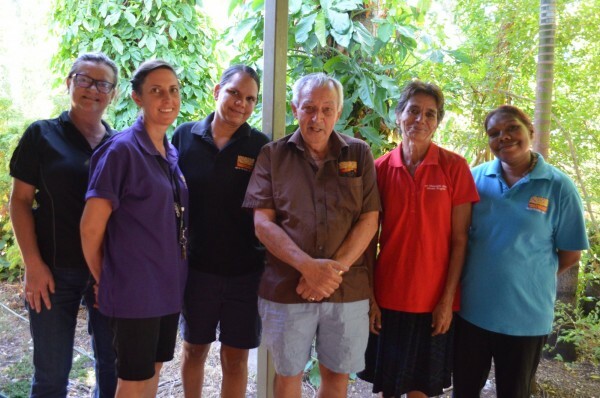 A research project in the Northern Territory (NT) is looking to minimise the transmission of Group A Streptococcus (GAS or ‘strep’) – the bacteria responsible for acute rheumatic fever (ARF) and rheumatic heart disease (RHD) – by employing local Aboriginal Community Workers to help establish ‘Strep-free zones’ in homes of people living with ARF and RHD. The Secondary Prophylaxis (SP) Plus project is a collaborative project between Menzies, the NT Centre for Disease Control RHD Control Program, the NT Department of Housing and the End RHD Centre of Research Excellence. Aboriginal Community Workers are being employed to help monitor health hardware (washing machines, sinks, refrigerators, toilets, etc…) in peoples’ homes, educate people on the importance of early detection and treatment of sore throats and skin sores, and assist in efforts to encourage patient adherence to treatment. “Our research to date shows how fundamental community engagement is for effective delivery of care. It’s often not possible to do this effectively by reaching out from the clinic, it needs to be a grass-roots initiative driven by community members themselves. We want to add a ‘plus’ to the standard secondary prophylaxis by adding primordial and primary prevention at the household level and employing people within the community,” said lead investigator Associate Professor Anna Ralph. Children and young adults with rheumatic fever need long-term penicillin injections, called secondary prophylaxis (SP). However, this is not enough to stop rheumatic fever recurrences that may lead to permanent heart damage, because not everyone can get every needle on time every 28 days for years on end. Employing Aboriginal people within their communities can support families affected by rheumatic fever at the household level. RHDAustralia spoke with one of the Aboriginal Community Workers employed on the project. She explained the importance of having local people working on the ground liaising between clinics and community members; “It’s important to employ local Indigenous people in the community. We know these people, we know these kids, we know the parents, we know the health workers at the clinic. If someone from outside the community tried to come in and do this role, they wouldn’t know any of the families we’re working with – it just wouldn’t work. Because I’m part of the community and know the people they trust me”. Project manager Angela Kelly travels frequently to the communities involved in the study to provide training and support and collect oversee collection of data on strep infections, health-seeking behaviours and health hardware. She noted that the Aboriginal Community Workers were instrumental to bridging the gap between western medicine and traditional Aboriginal culture. Research has shown that for prevention and treatment of chronic diseases to be effective in Aboriginal and Torres Strait Islander communities, the provision of care must include a chronic care model that is culturally appropriate and carried out by, or at the very least supported by, local Aboriginal and Torres Strait Islander people from the community. Two recently published papers from the Improving delivery of Secondary Prophylaxis for Rheumatic Heart Disease (RHDSP) study, have concluded there must be a more holistic and community driven approach to chronic care models if rates of ARF and RHD are to be reduced. “Our findings indicate the critical importance of improving engagement between healthcare services and Aboriginal patients. The ongoing challenges in delivery of secondary prophylaxis make a compelling case to broaden the scope of ARF prevention activities, with particular emphasis on primordial and primary prevention both among individuals with existing ARF or RHD and among whole communities,” said Associate Professor Anna Ralph. The RHDSP project showed that community engagement and self-management support aspects of the chronic care model were not well implemented. Results from this study were used to guide the design and implementation of the SP Plus project, with special attention paid to ways in which community engagement can be done in an effective and appropriate manner. The SP Plus project is led by RHDAustralia’s Clinical Director and Head of Global and Tropical Health Division at Menzies School of Health Research, Associate Professor Anna Ralph through funding provided by the End Rheumatic Heart Disease Centre of Research Excellence (END RHD CRE) at Telethon Kids Institute and the Heart Foundation (Vanguard Grant). ARF and its complication RHD lead to premature morbidity and mortality, and occur at unacceptably high rates in Aboriginal communities. Yet ARF/RHD is almost entirely preventable by stopping transmission of streptococcal infection and by ensuring adherence to treatment.